This week leaders in Congress are trying to decide what action to take on a set of “tax extenders” – a hodge-podge of tax breaks that range from the arguably meritorious to the patently absurd that could cost the government as much as $590 billion if Congress adopted a package favored by House Republicans. While that fight brews, it pays to remember the work Congress is not doing to ensure corporations pay their fair share of taxes. Some of the consequences are laid out in a report released today by The Center for Effective Government and the Institute for Policy Studies. 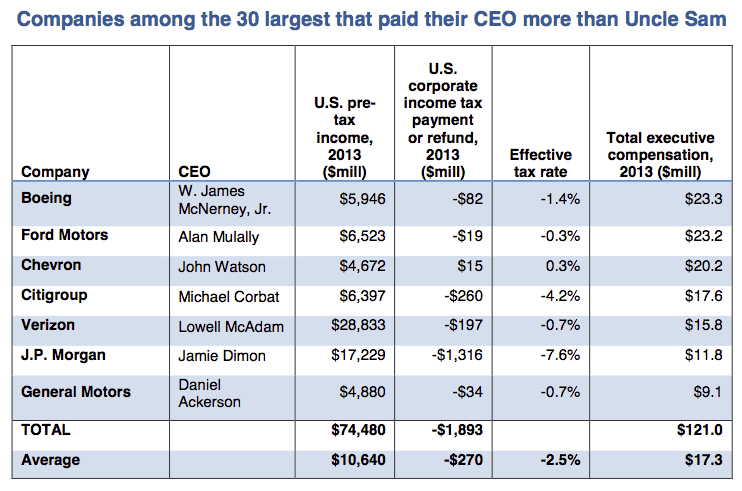 That report finds that 29 of America’s 100 largest corporations paid more to their CEO than they did to the federal government in taxes in 2013. In fact, the report states, “The 29 firms reported $24 billion in U.S. profits last year and yet collected $238 million in tax refunds.” That’s right: these firms not only did not pay net federal taxes; they received a refund. Some of the companies were able to claim refunds because they claimed financial losses – but that’s not true of the companies at the very top of the list, the seven of the 30 largest multibillion-dollar American corporations that pay their CEO more than they pay in taxes to the federal government. In fact, most of the seven corporations got refund checks from the government. A particularly egregious example is that of JPMorgan Chase and its chief executive, Jamie Dimon. JPMorgan Chase had a pre-tax income of more than $17 billion in 2013, according to the report, and Dimon’s take-home pay that year was $11.8 million. JP Morgan’s net tax bill? A negative $1.3 billion. That works out to an effective tax rate of -7.6 percent. That’s revenue that could have been used to help school districts replace nearly all of the public school teaching positions lost in the 2008 recession and its aftermath, the report said. Or it could be used to resurface 22,240 miles of road. Or it could fund two months’ worth of health care services at veteran’s hospitals. While conservatives argue that keeping more dollars in the hands of the corporations means more of an incentive for them to invest and create jobs, the report includes the reminder that while the actual tax rate paid by large corporations has averaged just 19.4 percent – not anywhere close to the “statutory” rate of 35 percent – corporations in the past few years are “engaging in record levels of repurchasing their stock and in buying out competitors through mergers” instead of making job-creating investments. Many of the techniques that these large corporations use to lower their tax bills to below zero are included in the package of tax extenders that are now pending before Congress. They include the “active financing exception” that allows corporations to dodge taxes by shifting profits from leasing and lending activities to offshore entities, and accelerated depreciation rules that were initially written into the 1999 Recovery Act to encourage corporations to spend money during the depths of the recession but that corporations now want to make a permanent part of the code. The report also lists bills that Congress should really be considering on the way to broader corporate tax reform. Michigan Sen. Carl Levin’s “Cut Unjustified Tax (CUT) Loopholes Act (S. 268)” would remove some of the tax advantages of offshoring. The Corporate Tax Fairness Act by Vermont Sen. Bernie Sanders and Illinois Rep. Jan Schakowsky would eliminate the ability of corporations to defer taxes on their offshore profits. Then there are the proposals in Congress that would eliminate the tax advantage for “inversions,” in which a U.S. corporation buys an entity in a low-tax country in order to claim that country as its headquarters for tax purposes. Most of the voters who went to the polls earlier this month find this repugnant, but congressional campaigns are funded by the very corporations who are this week lobbying to keep these and other tax advantages on the books. Nonetheless, we need to keep our voices loud and strong against corporate tax giveaways that take from the many to concentrate wealth among the few – even as we also fight for a political system where our voices count more than their money.